Defence Secretary Gavin Williamson has announced measures to maintain the UK’s world-leading chemical analysis and defence capability, as he warned of the intensifying threats the country faces in his first keynote speech in the role. Whilst outlining his vision for the ongoing Modernising Defence Programme on a Policy Exchange platform at Rolls-Royce’s Bristol factory, the Defence Secretary claimed that the ‘reckless attack in Salisbury’ should leave the country in no doubt of the threat which Russia poses to our citizens, in addition to other dangers from across the globe. "The choice before us as a nation is simple - to sit back and let events overtake us or step forward. Our Modernising Defence Programme will make sure our country can respond to the changing nature of warfare and the new threats we face to British interests. Russia, in particular, is ripping up the rulebook - we only have to look at the reckless attack in Salisbury. "Today I can announce we are investing £48 million in a new Chemical Weapons Defence Centre to maintain our cutting-edge in chemical analysis and defence. I’ve also made the decision to offer the anthrax vaccine to our forces at the highest readiness, providing them with vital protection against a deadly danger. By using all our power, hard and soft, Britain will continue bringing light to a darkening world." The Defence Secretary praised the bravery and professionalism of the Armed Forces in their role supporting the police in their investigation into the poisoning of Sergei Skripal, as well as commending the expertise of Britain’s world-renowned scientists from the Defence Science and Technology Laboratory (DSTL) at Porton Down. In light of the response to the attempted murder, he has announced that DSTL will receive £48 million of extra funding to invest in a brand new ‘Chemical Weapons Defence Centre’ at Porton Down to ensure the UK retains its world leading capability in chemical analysis and defence. With main construction on the Centre set to begin next month, it will go on to contain cutting-edge chemical analysis laboratories with the capability to identify any chemical agent through forensic analysis. With the chemical, biological, radiological and nuclear (CBRN) threat growing from a range of state actors, the Defence Secretary also announced that thousands of troops held at high readiness will be vaccinated against anthrax. This will ensure that troops are both protected and are ready to deploy to areas where the risk of an anthrax attack exists. In the face of intensifying global threats, the Defence Secretary launched the Modernising Defence Programme earlier this year, which will ensure the UK Armed Forces can meet the complex and evolving challenges that Britain and its allies are confronted with. With headline conclusions expected in the Summer, the Defence Secretary today outlined how the programme will see ‘a more productive, harder-hitting Joint Force able to counter conventional threats and deal with new challenges’. Ahead of the speech he also toured the Rolls-Royce factory meeting workers and apprentices. The site supports engines for the likes of the Typhoon and A400M aircraft, the Queen Elizabeth-class aircraft carriers and the Type 26 frigate programme, and makes the lift system for the F-35 fighters jets which will allow them to vertically take-off from the carriers. 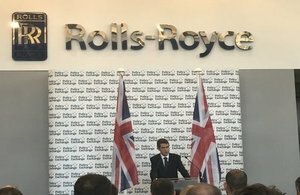 The Defence Secretary used the opportunity to praise the role of Rolls-Royce and emphasised that working with industry and boosting and protecting jobs in the defence sector would also be a key part of the Modernising Defence Programme. He also announced that the department will be spending almost £4million with Thales and General Dynamics Land Systems-UK to deliver a Shot Detection System for the new Ajax armoured vehicles, which can sense enemy gunfire and protect troops.